Dry ice shaving machines offer the gentlest and most precise cleaning available. Shaving ice at the machine provides much more consistent and efficient cleaning compared to breaking up the ice in the nozzle. 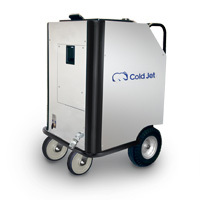 Cold Jets patented dry ice shaving technology allows unprecedented cleaning control. Shaving dry ice from a block provides much smaller particles, and many more of them. For thin contaminants, and delicate substrates, shaved dry ice provides the quickest most consistent clean. 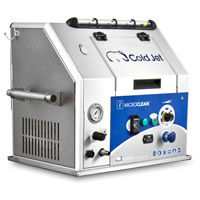 The Microclean is the smallest most precise dry ice cleaner available. The i³ MicroClean thoroughly cleans small, complex cavities and crevices that other methods cannot reach. As well as cleaning delicate surfaces faster than traditional cleaning methods - without abrasion or disassembly. The i3 Microclean operates with nozzles as small as 3mm in diameter, and up to 22mm. The SDI Select 60 can use any Aero blasting machine nozzle or accessory to suit your application's need, and can be as gentle or agressive as necessary - with blasting pressures ranging from 20 to 250 PSI - covering the widest range of applications in a single machine in the industry.